When you first learn how to crochet a blanket, you want one that is quick and easy so you don't have to wait for weeks to see the results of your efforts. As far as crochet baby blankets go, this one is a fast, easy crochet project. It uses only two basic crochet stitches: single crochet and chain stitch. And using a larger-than-usual hook size gives added drape to the blanket and helps the work to go a little faster than it would otherwise. This pattern is easy enough for beginners, but this is also a good pattern for crocheters of all skill levels who want a quick and easy project to work on. This is a good crochet pattern for meditative crochet since it has an easy repeat and uses only basic crochet stitches. It is the type of easy crochet baby blanket that you can work on when waiting in lines, sitting in the car, or watching television. The recommended yarn for this project is Bernat Softee baby yarn. The weight is "light worsted," "DK," or "Double Knitting." This is important to know in case you want to select a different yarn to substitute; look for the same weight if you aim to create a blanket with the same drape. That said, you can use any yarn weight and a corresponding hook size to create an easy crochet baby blanket using this pattern. This crochet baby blanket pattern includes instructions for three sizes: preemie, newborn, and toddler. Instructions list the smallest size first with changes for the larger sizes noted in parentheses. The measurements below don't include any edging; if you wish to add a baby blanket edging, your finished blanket will be a little bit bigger. The smallest blanket measures about 26 inches wide by 34 inches long. If you crochet your blanket using Bernat Softee, you will need 2 to 3 5-oz skeins of yarn to complete this project, depending on how tight you crochet. As far as yardage goes, you'll need about 724 yards / 662 meters for the blanket itself, plus a bit more for your gauge swatch. The mid-sized blanket is 30 inches square. You can make it a little bit longer if you prefer a more rectangular shape for the blanket. If so, aim for 30" x 34". You will need 2 to 3 of the 5-oz balls of Bernat Softee for this size, depending on how tight you crochet. The largest of the blankets measures 36 inches by 44 inches. You will need 4 5-oz balls of Bernat Softee to crochet this size. Crochet Hook: Size I crochet hook. You might need a different size hook to achieve the correct gauge. Tapestry Needle: Use this for weaving in ends when you finish crocheting your blanket. Stitch Marker: Use a stitch marker or safety pin for marking a stitch at the beginning of your work. Stitch gauge: 4 stitches = 1 inch when crocheting the stitch pattern as instructed below. Row gauge: The row gauge is not important for this pattern. To check your gauge, crochet a gauge swatch. Form a starting chain of 25 stitches and crochet using the blanket pattern instructions until your piece is square. End off. Measure your swatch to see how many stitches per inch you are crocheting. Compare your gauge against that recommended in the pattern (above). If you are crocheting fewer stitches per inch than recommended, try again with a smaller crochet hook. If you are crocheting more stitches per inch, try again with a larger hook. The swatching process is necessary because you want your baby blanket to be a useable size. 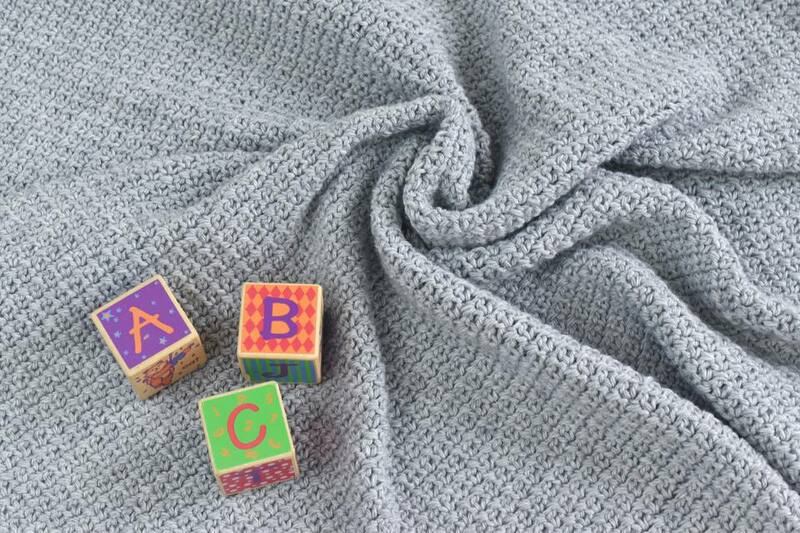 If your gauge is different, your baby blanket could finish at the wrong size or you may run out of yarn before finishing the blanket. The pattern directions instruct you to crochet into the ch-1 spaces. If you have difficulty finding these—sometimes they seem to vanish—carefully poke your finger at the row of stitches from back to front. Your hands will feel the gap even if your eyes don't spot it at first. Ch 105 (121, 145). Remember, the instructions are for the small size (with the medium, large in the parenthesis). Row 1: Place a stitch marker in the first ch from your hook. Sc in 3rd ch from hook. [ch 1, skip next ch, sc in next ch.] Rep across the entire row. ch 1, turn. Row 2: [sc in the next ch-1 sp, ch 1.] Rep the sequence in brackets across the rest of the row. At the end of the row, work a sc st into the st where you placed the marker; you can remove the marker before working the stitch. ch 1, turn. Rows 3 and Up: The rest of the rows are all exactly the same as row 2, with one minor difference: at the end of the row, work your last sc st into the turning chain of the previous row. Rep this row until the baby blanket reaches your desired length. Note: When you need to change to a new ball of yarn, use the same technique as you would for changing colors. This crochet pattern works fine without any additional edging, but you can add an edging if you want to. There are many baby blanket edgings to choose from. A simple single crochet stitch around the entire edge of the blanket is an easy choice that goes well with the single crochet design in this pattern. Make a sweet and simple crochet headband with this free pattern.